The Inner Ring tends to lose population to other parts of Ontario. Figure 21 shows that net intraprovincial migration has been negative for the past 17 years. During the late 1980s, while the employment rate was high, migration fell sharply. 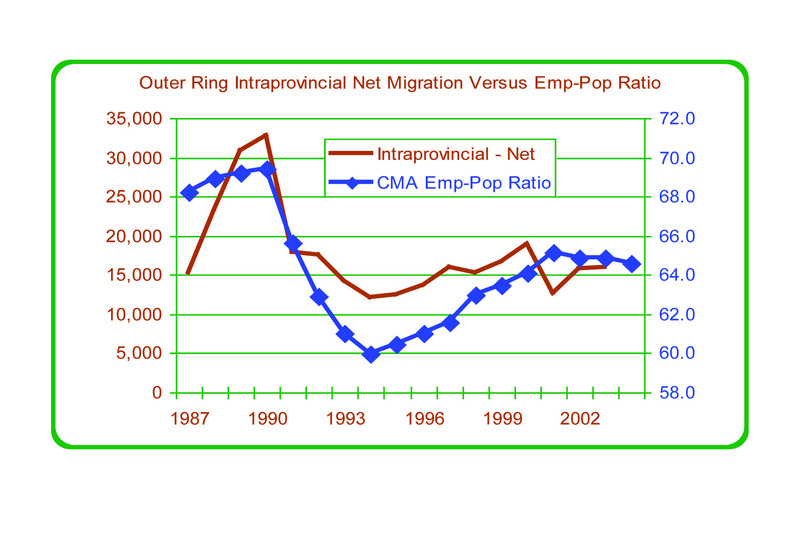 As the employment rate fell during the early 1990s, net intraprovincial migration began to recover. As the employment rate expanded during the second half of the 1990s, migration did not improve further. In fact, intraprovincial net migration may have started to fall in 1999, before the peak of the economic cycle. The last available data point for the intraprovincial data is for July 2003. It is not possible to review the relationship in the current economic environment. Figure 22 shows net intraprovincial migration for the Inner Ring relative to house prices. It appears that out-migration during the late 1980s may have been due to rapid increases in house prices, the recovery of migration in the early 1990s to price reductions, and the muted migration figures in the late 1990s to the resumption of price increases. As will be discussed later, when the employment rate and house prices are analyzed in combination, employment has the expected positive effect on net intraprovincial migration to the Inner Ring, although the effect is weak. House prices have a strong negative effect on this component of population growth for the Inner Ring. 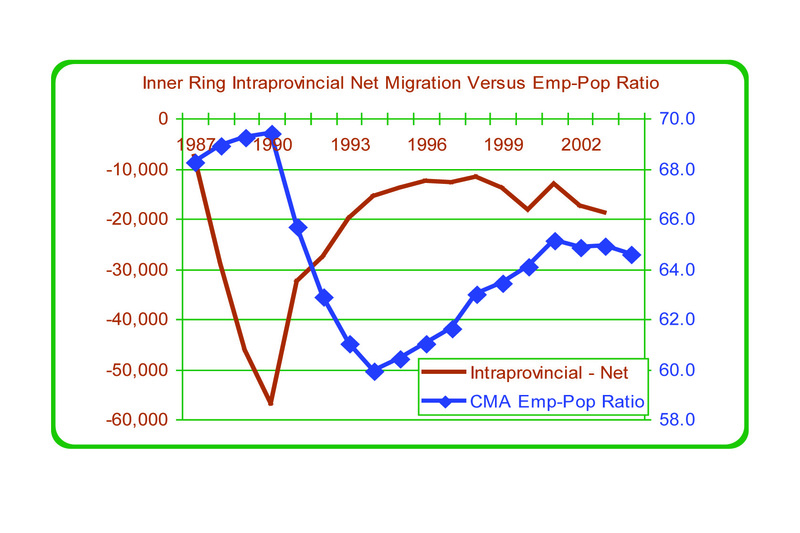 Figure 23 shows a strong positive relationship between the Toronto CMA employment rate and intraprovincial migration. However, in 2001 there is a sharp downward shift in the migration data. The cause of this shift is not clear. 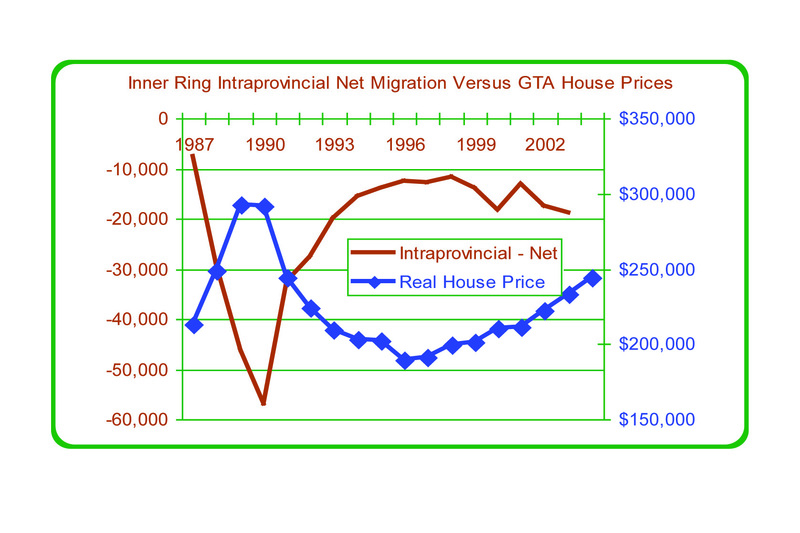 Figure 24 indicates a positive relationship between GTA house prices and net intraprovincial migration for the Outer Ring. 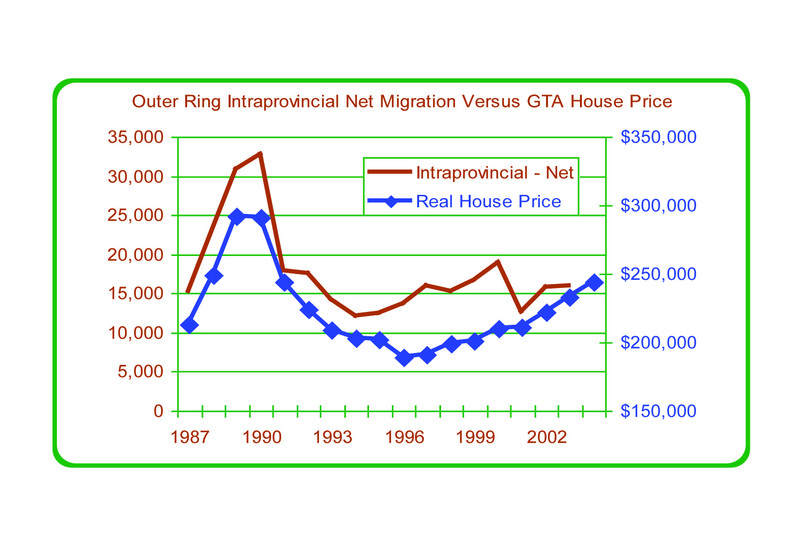 As house prices rise in the GTA, the Outer Ring gains population from intraprovincial migration.